It was hard work on the water today. Part way up the San Gabriel River we got a short break to walk around on the rocks for a little bit. Land breaks are a nice distraction from the constantly moving water. There was much to explore with all the rapids, bugs, and sound around me. 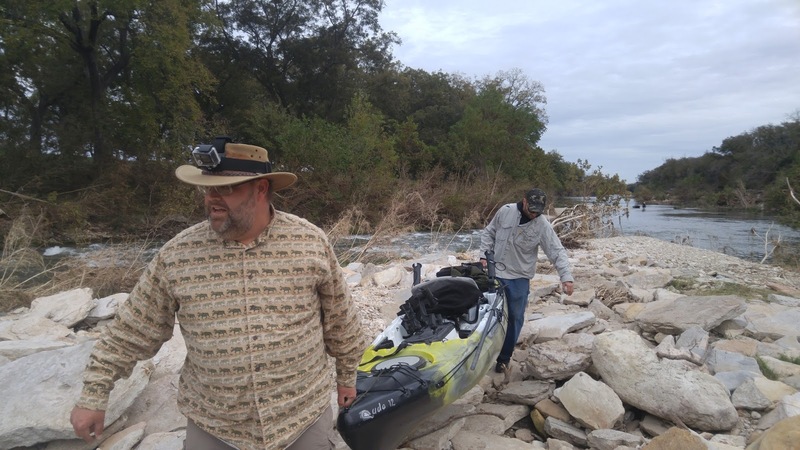 After getting back in the kayak toy and getting back on the water it was back to routine. The greatest excitement of the day happened when the human female actually caught the trophy fish for the day. Me I was enjoying the cloudy, breeze weather that has come with the fall season. There is nothing better than a nap in your comfy spot on the kayak toy in the middle of a cool fall day. Since the female caught the big fish of the day the males decided they had to go the extra mile to get to the bigger fishing hole to win the prize for the big fish. 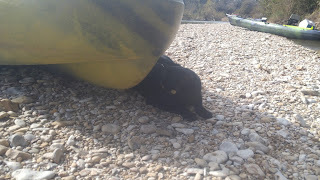 I could not accept putting up a picture of me and my kayak toy being carried over the rocks so I replaced it with a picture of one of the other kayak toys being carried. At the back end of the kayak toy is an acquaintance we have some time ago before I starting supervising the kayak toy adventures. The most important break of the day is lunch break. I guarded the kayaks while the humans ate. The humans always make sure I get my food first so I can guard the kayak toys. It is important for me to be protecting my territory with all the strange people around. Not only did we meet up with a friend, but we also met up with strangers who had a very big and different boat compared to my kayak toy. The humans called it a john boat, I called it noisy. 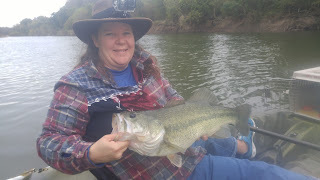 We made a quick dash all the way back to the truck with no pictures allowed because we were on a central Texas river and the rain started to come heavy enough to invade all the way into my comfy spot. The humans paddled, and paddled, and walked and then paddled some more until we finally made it to the truck. I was glad to be back in the warmth and quiet of the truck after such a hard wet last stretch to the day. On Sunday the sun came out for part of the day and I went to my favorite windows spot and remembered how hard I worked yesterday which was just what I needed to send my right to a nice cozy nap. Thank you for letting me join your blog hop Create With Joy. Shadow, it is good to meet you. And thanks for coming by our blog. You have quite an exciting life. Sounds like fun. Glad you you have a warm comfy place to go back to. You all take care. Nice to see you again! And you're still keeping up with this kayak business - you're a true hero! We hate both noise and water, and we're surprised that you made it through the day! 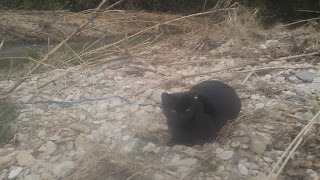 You have a lot of jobs from kayak cat to guard cat :) Good job! What a fun trip, Shadow. And that's one big fish! Shadow that was another fine adventure. What a fishy too! 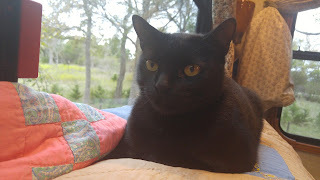 Wordless Wednesday - New Blanket.